Geopolitical realities suggest that the recent election of an anti-base candidate is unlikely to change much. Yet another high profile gubernatorial election has come and gone in Okinawa, and yet again another anti-base candidate has won. Takeshi Onaga, the anti-base candidate who ran as an independent, handily defeated incumbent Hirokazu Nakaima. The governor-elect promises to be a thorn in the side of the central government and current Japanese Prime Shinzo Abe. Onaga has vowed to halt the construction of the runways at Camp Schwab, a Marine Corps base that lies adjacent to the small village of Henoko on Okinawa’s northeastern shore. Camp Schwab has been designated the replacement facility for Marine Corps Air Base Futenma, currently located in the densely populated city of Ginowan in central Okinawa. Futenma and the proposed replacement facility at Camp Schwab have been a source of political contention for decades. Onaga is just one of many Okinawa political leaders who have promised to have the plans for the replacement facility scrapped and Futenma relocated outside Okinawa prefecture altogether. Yet, Futenma still functions at full capacity and the landfill and construction for the replacement facility continue virtually unimpeded. Conceivably, Onaga could prove to be a political disturbance potent enough to force Tokyo to abandon its plans. More likely, Tokyo will call his bluff and clamp down politically and economically. Regardless of the rhetoric from anti-base Okinawan politicians, not a lot has been accomplished in terms of large-scale base reductions. In reality, besides generally being a nuisance, there is not much Onaga can do to halt the construction of the Futenma replacement facility already underway at Camp Schwab. As recent history has shown, Okinawan leaders simply do not have the leverage to force Tokyo’s hand, leaving anti-base politicians quite able to make promises, but quite unable to keep them. One thing Onaga’s victory and anti-base tough talk has done is rejuvenate calls in Okinawa for equal representation and self-determination. Indeed, much of the hyperbole surrounding the Okinawa base issue focuses on failings of democracy and perceived injustices. Unfortunately for Okinawans, these legitimate concerns are trumped by international politics, and particularly by the realist imperative for states to survive in an anarchic international system. In other words, local concerns must confront Japanese and U.S. national security needs. That leaves the fate of Japan’s southernmost prefecture determined by geopolitical factors over which its people have no control. Okinawa’s future, like its past, will be decided by powerful states that possess the material resources to coerce a much weaker and resource-poor community to bend to their will. Such is international politics. The U.S. has been the dominant power in the Pacific for nearly 70 years, thanks to its economic and military power. Throughout this period, the U.S. has maintained a large military presence on Okinawa. Initially, Okinawa was to be used as a staging ground and launching pad for the planned invasion of the Japanese main islands in the closing days of World War II. Two atomic bombs dropped on Hiroshima and Nagasaki made the invasion unnecessary, leaving a large contingent of U.S. forces stationed on Okinawa with a huge stockpile of military hardware and no discernible mission. U.S. policymakers then turned their attention to the nascent Cold War and the march of communism across Eastern Europe and large parts of Asia. For several years following its defeat, Japan was a fledging democracy struggling to maintain internal stability. With a defunct economy and widespread misery, communism held considerable appeal. There was real fear in Washington that with the Soviet Union knocking on Japan’s northern frontier, Mao’s victory in China’s civil war, and communism’s growing influence within Japanese politics that the Red Scare would become too powerful to contain. Given its prime geostrategic positioning and already large military presence, Okinawa became an American military bastion and the lynchpin in the U.S. strategy of Cold War containment in the Asia-Pacific. In 1972, after 27 years under an American military administration, Okinawans finally got what they had long sought when Okinawa prefecture was returned to Japanese control. But Okinawan temperaments would not remain placated for long. With reversion, locals expected a considerable drawdown in the U.S. military presence. While the Okinawans did not harbor any illusions that the bases would be eliminated altogether, they did expect that the burden would be reduced and at least made comparable to that shared by the mainland. 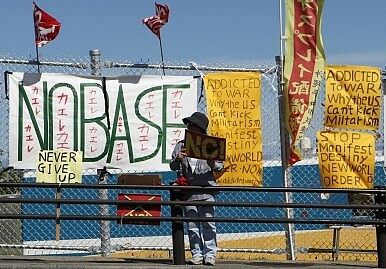 They soon learned this was not to be; the U.S. bases would remain intact. After more than a quarter of a century under foreign military rule, most Okinawans felt they had shouldered the burden of Japanese security for long enough. Yet the U.S. bases, and all the baggage that comes with them, would remain. Geography is at least partly to blame. Okinawa has been prized not because of its material or natural resources (there are virtually none to speak of), but because of its geostrategic location in the middle of two powerful states – China and Japan – that have competing visions for the Asia-Pacific. Located in the middle of vital shipping lanes that crisscross the East China Sea, Okinawa is prime military real estate. With its relatively calm seas and abundance of natural ports, the prefecture provides an excellent staging ground for naval forces used to patrol and defend sea lands of communication. Moreover, whoever controls Okinawa is able to block maritime access to the greater Pacific Ocean and southwards toward the South China Sea. The rhetoric emanating from Beijing and Tokyo notwithstanding, the ongoing dispute over the sovereignty of the Senkaku/Diaoyu Islands is about much more than natural resources, fishing rights, or historical integrity. It is about the future of the Okinawa islands and which regional power will control and use them to their strategic advantage, ultimately to control the Western Pacific. It is no secret that China aspires to eventually push U.S. maritime control back beyond what it calls the first island chain. This is one of two lines of demarcation invented in Beijing to note its intended area of control. Running south from the Japanese island of Kyushu, along the Western edge of the Philippines, the line wraps around the South China Sea ending at Vietnam. The main island of Okinawa lies in the center of the line. As recently as May 2013, the mouthpiece of the China Communist Party, The People’s Daily, declared that not only are the Senkaku/Diaoyu Islands a sovereign part of China, but so too is Okinawa. This statement was a declaration of ownership, a calculated declaration that Okinawa, historically, belongs to China. Combine it with Okinawa’s position at the center of the first island chain, and it is not irrational to conclude that real threats to Japan’s security exist. It could then be argued that the size and scope of the U.S. bases in Okinawa are justified and will remain so for the foreseeable future. Again, security concerns will trump domestic politics. The fact that Japan is a functioning democracy will have no bearing on the reality that Okinawa has a crucial role in defending Japan and preventing China from achieving Western Pacific hegemony. With its prime geostrategic location and its weak force, Okinawa will continue to be used as a military staging ground by an external power, whether it is Japan, China, or the United States. Elected officials might make promises, but ultimately they will be coerced or cajoled into acquiescence. Unfortunately for the people of Okinawa, the election of Takeshi Onaga is unlikely to change this. The expansion of Camp Schwab continues and the risks of keeping Futenma operational remain. And so goes the status quo for yet another gubernatorial election cycle in Okinawa. Okinawa & Futenma: Deal Or No Deal? Tokyo appears to be on the verge of finally settling the controversial issue. Will it succeed?